It was late in the morning on the bank of the river Cauvery. 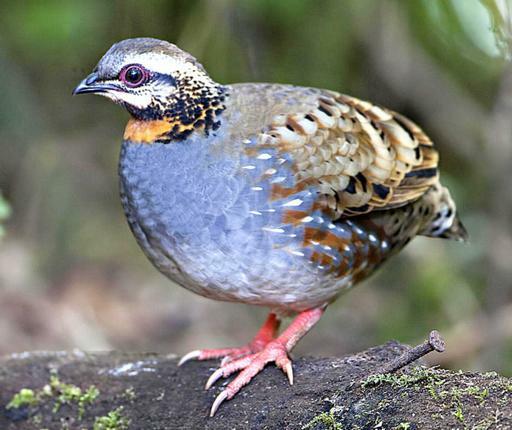 Eight of us friends were walking along the tree-lined bank and watching birds in that strip of riverine forest filled with Terminalia arjuna trees. Suddenly someone screamed. We all huddled together and looked where the finger was pointed. Looks like a wasp. Is it? Yeah, it is a wasp. Amazing glittering blue colour huh! Hey, look! It seems to have caught something. A spider! Looks like a tarantula. See, how hairy it is! Yes, it is! It belongs to a group of spiders called mygalomorph. No, not for us but they can kill their prey. Wow! Never knew that tarantulas occurs in our country. Yeah, they do. I think there are some 20 species reported. These tarantulas generally live inside tree holes. Oh ok. Are you sure the wasp got the spider or was it the other way around? Looks like the wasp was the predator, see it is still stinging its prey. There is no movement from the tarantula. What a sight! We missed the initial action. It would have been an amazing sight watching the wasp catching the tarantula. What will the wasp do with its prey now? It will take it to its nest, I think. Who knows it might lays eggs on it and the young wasp’s caterpillars would then eat this tarantula when they hatch. Hey look at what it is doing now. It is cutting off the legs of the tarantula! Wow! Yeah, you are right. Look at the way these legs are cut. Surgical precision! Wonder why it is getting rid of the legs? Too big to carry may be? Easier to carry without legs? Too much energy spent carrying with the legs may be? Hey, it’s moving. Don’t go too close, you might disturb it. The wasp must be half of the weight of that tarantula. But they have sharp claws in their legs. Still it is not so easy for the wasp to carry the spider, isn’t it? I can see its struggling. Yeah ,that’s true. Hard work. I think once it climbs on that fallen log it will take off. Yeah may be, let us wait and watch. Hey guys, look who entered this scene! There is a calotes looking at this wasp. The calotes is coming closer. Looks like the wasp is going to lose its food to this reptile after all the hard work it has put in. Ohhhhhh! Bravo wasp. The calotes has stopped halfway. It has changed its mind. Does not want to take the risk. 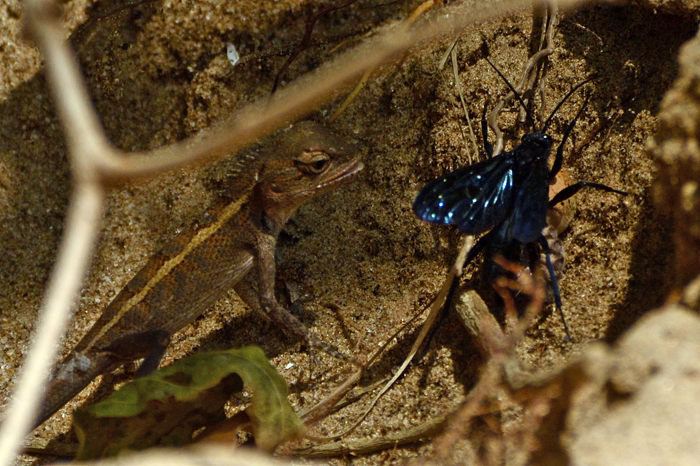 Even this big calotes couldn’t catch this mighty wasp. 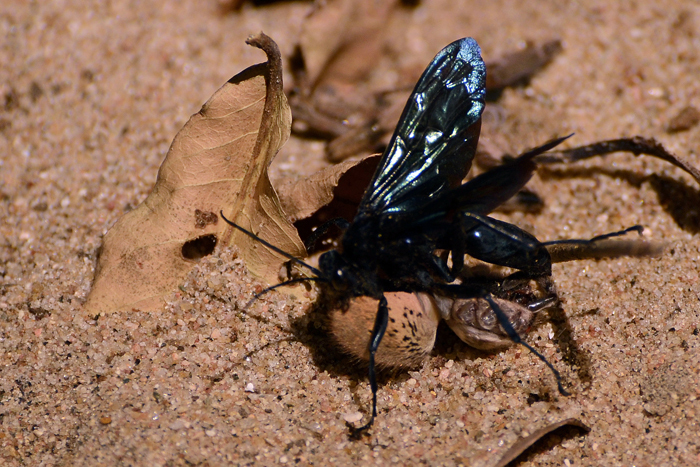 There is a wasp called the Tarantula Hawk Wasp. This maybe one of those. You know they have aposematic colouring which means its bright colouring warns predators about how unpalatable the wasp is. Oh it’s really fascinating! So, the glittering blue colour is a warning for the calotes? This is the most exciting live action I have ever seen in a forest. Have you taken any photographs of this action? I got a few but it is too dark out there. Oh no! We missed the wasp. Where is it now? There it is climbing the tree. There goes my theory. I thought it will take off after reaching an elevated area but doesn’t look it’s going to happen. Wow! It’s just climbing vertically on that tree bole! Like a leopard carrying a deer on a tree trunk. From the place where it cut the legs of the tarantula, it must have walked and climbed with its prey for about 7 meters now. Suddenly, silence enveloped us and all the chatter died down. We watched the tarantula till we could see it no more as it disappeared somewhere high up on the trunk. I guess we were all pondering over different questions– What would it do with its prey? Has it laid eggs? When will it be hungry again for its next meal? 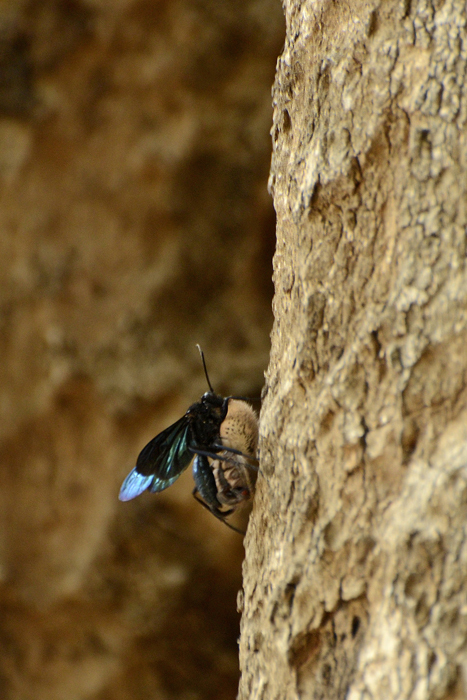 – as we felt deeply grateful for being witness to this little piece of action in nature. This is a beautiful article, Jegan, the details in the article are matched by your way of writing, wow!